Last Saturday I heard a local ham saying he had an old HW-16 for sale. It is a cw transceiver made by Heathkit in the '70s and designed for the Novice class license holder back then -- a low-power, crystal controlled transmitter. I stopped by on my way home from work a couple days later, and by Wednesday night I was on 80 CW with my one crystal at 3841 calling CQ. First call I was answered by KB8AXS, Mike in Cincinnati. My bug -- a semi-automatic key -- fell apart in the middle of the contact and I finished up with the hand key. That's old-time ham radio, a straight key and simple CW only radio. So that's my new vintage station. Look for me on 3841. Tonight I heard an old friend, N9HAL, calling CQ on 80 meters. I ran into a guy named Bob from Wisconsin a few years ago on 40 cw. We started talking and trading personal information. It turned out we were both originally from Nebraska. Then he asked me if I used to be WA0QMZ. It turned out he used to be WA0ODM, we went to junior high and high school toghether and were both helped along by the same group of older hams in Sidney, NE, the small town we grew up in. Small world. Bob and I have had some random schedules, but most often we just hear each other on 80 or 40 once or twice a year, and then spend some time catching up. 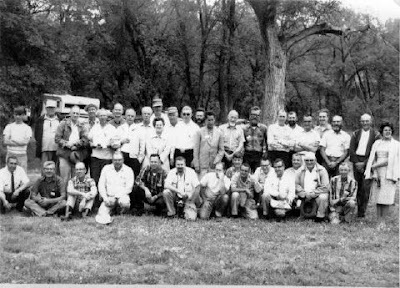 It gives me a nice bridge to the past, plus we have a lot in common today and talk about fixing up old radios, operating CW, and some random things. Contacts like that are why this is such a nice hobby. This week the K4M DXpedition to Midway Island has been on the air. I made a few half-hearted tries at working them on 17 meters this week in the late afternoon, and heard them before work on Friday morning on 40 meters, but didn't have time to chase it. So this morning (Saturday) I got up at 4 a.m. as they are only on the air for a few more days. By 4:40 I had them in the log on 40 meter cw and I got them on 30 meters by 5:30. I spent a little time on 80, but I couldn't hear them very well. I actually heard them better on 160 this morning, but didn't have any luck snagging them there. I tried a little on 40 SSB, but at that point the sun was coming up. Oh well, I got them on two bands, so I'm happy. Now it's 7 a.m. and I'm ready for a nap. Tomorrow is the Illinois QSO party, and I plan on hitting it hard. I'll have an update tomorrow night. This morning the Oceana DX contest was on, and there on the bottom of 40 were quite a few Australians and New Zealanders calling CQ. I worked everyone I heard. Nice to start the weekend with a little DX on 40. Gearing up for Illinois QSO party next weekend. I plan on hitting it hard from the home station. I'm not exactly in a rare county -- DuPage -- but looking at last year's results I didn't do bad. It would be nice to break into the top 10 this year. Our success was due to good antennas. Here are photos of the 20 meter loop held up by Brad's push-up pole and my phased verticals, with my aunt's windmill in the background. No, we didn't use the windmill as an antenna support, but we thought about it. I travelled to Nebraska again this year to particpate in Field Day with my cousin Brad, KG0GY. We did our first attempt last year, had a lot of antenna problems but managed about 360 contacts. This year we were much better prepared and organized on the antenna front, and did 800 contacts as a 2B station. We ran a K2 and an Icom 756 Pro to phased verticals on 40, a loop up about 40 feet on 20, and a multi-band OCF dipole on 80, 40 and 15. The dipole wasn't high enough for us to do much on 80, but it did well on 40 and 15. We were very happy to more than double our contacts from the year before, and we're starting to wonder how to top that next year. We operated about 15 hours, slept for a few hours in beds, and had dinner with my aunt. Not a bad Field Day at all. Shown in the photo is Brad, running the K2 on 40 meters. We were inside the door of an old shed, but running on emergency power. I was having problems with high SWR (standing wave ratio) on my ATAS 120 mobile antenna. My guess was the feedline, which was the standard tiny coax that comes with a Comet or Diamond trunk lip mount. I ordered the Coment 3D4M coax cable assemly, which has 13 feet of RG58 coax. All of a sudden my SWR on the ATAS goes down to 1:1 on 40 meters and some random RF problems are solved. Lesson -- use real coax on HF mobile, not the miniature type that's designed to go through a gap easily, but may be so-so on transmitting and sheilding RF. I made it to the Dayton Hamvention and back last weekend. The highlight for me was the contest forum on Saturday morning. I just stumbled into it, but had a great time and learned some things. I seemed more at homewith the contesters than most of the groups I was involved with at Dayton. Most contesters are CW ops, that's part of it. My big Dayton purchase was a Stationmaster controller from Microham. It's purpose is to interface between the K3 and the PW-1 amp. I got it up and running, but it's been buggy so far, and seems to go into error mode every now and then. I'll keep messing with it, but so far I'm regretting my purchase. It added a lot of complextity to the station, just so I wouldn't have to push a button on the amp and the SteppIR vertical controller when I changed bands. I saw that at good insurance for the amp, but so far, I'm not sold. More on that later. I'll be in Dayton one week from tonight. Any followers or tweeters going to be there. Let's do a meet-up. 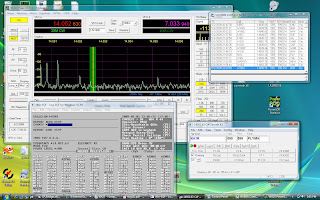 This weekend I was able to run two large QSO parties at the same time -- the New England QSO party which covers the New England states, and the 7th Area QSO party, with all the 7th call district -- Washington, Oregon, Nevada, Utah, Arizona, Idaho, Montana and Wyoming. I had tried doing it in the past, but found logging a probem. You really need two separate log programs open. With the new setup with the K3 and LPBridge, I'm able to run two logging programs at once. Saturday night I was running the 7QSO party on WinEQF and the NEQSO party on N1MM logger. Both were up on the screen, so switching between the two was simple. I don't have exact numbers, but I did around 70 contacts in the 7QP and 40 in NEQP. I just didn't hear enough New England stations. On another note, I got my 80-meter dipole back up in the top of a tree where it belongs. It's now at 40 feet, rather than sloping from 40 to 10 feet. A few years ago I was visiting my uncle Merrit, WA0HFH and we went down in his shack and started going through his old QSL cards. I was amazed he had one from me, that I had sent him shortly after getting my license. It's not often you find something you wrote and sent as a 12-year-old. This was sent in late October 1965, and I got my license in August. 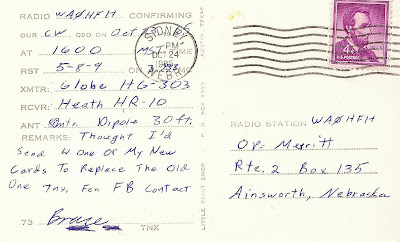 So I think, from reading the message, I had just gotten these fancy printed QSL cards, and was proud to send him one. During my novice days, I carried out a schedule with my uncle nearly every Saturday afternoon, chugging away at low-speed CW. At the time I didn't think much of it, but looking back now I realize the time he put in to help a nephew get on the air. My novice station was a Globe HG 303 transmitter and a Heath HR-10 receiver. My dad and I had built the receiver from a kit -- a weeks-long endeavor that I'm sure was a chore for my dad, but again, he willingly put in the time to help. I was talking about getting active mobile again, that's opertating cw HF from the car by my definition. I put the ATAS 120 back on the Chevy Equinox, and unfortunately, it seems to have died. I've run the Yaesu FT-857/ATAS 120 combo for a quite a few years and really like it, but the antennas don't seem to last that long. This is my second one that has died, so I don't think I'll buy a third. So I'm at a quandry -- what do I use for an antenna. I ran Hamsticks for years, and may go back to that. They are simple, cheap, and you don't feel bad when a $18 antenna fails. I'm also debating what radio and what car to do this in. I spend most of my road time in a Mini Cooper, but I spent a few hours trying to figure out how to shoehorn a HF rig into that car last weekend, an didn't come up with a solution. Hello to K2CZ who commented on my Mini Cooper silliness. Yes, I need HF mobile in it. I've got 2 meter/440 with the Yaseu FTM-10 -- that strange little radio designed for motorcylcle work. It does work well in the Mini, the control head has the speaker and the mic in it, so that's all I really have up front. But I miss my HF mobile. I ran a Yaesu FT 857 and ATAS 120 antenna for years, but the ATAS has died and my wife gave me an Icom IC-7000 for Christmas. I can see having the 7000 driving a Hamstick on the back of the Mini. I do a 90-minute commute two days a week, so I have plenty of mobile time to kill. That's my Spring project, if Spring ever arrives. Stay tuned. I thought it was jut me, but last month in both CQ and QST magazines, there were articles about how bad the bands have been this winter. Ok, that's my excuse for not getting on enough and not blogging. Actually, I've just grown lazy on the blogging. I was on last weekend and had three very nice CW rag chews. They were Bruce, K6ZB, in Thousand Oaks, CA; Tony, N2ATB, in Chrerry Hill, NJ: and Bill, KA1RVM in Hollison, MA. All three were nice conversational contacts, where we talked about a wide range of things clipping along at 25 wpm or so. That's when CW is really fun for me.